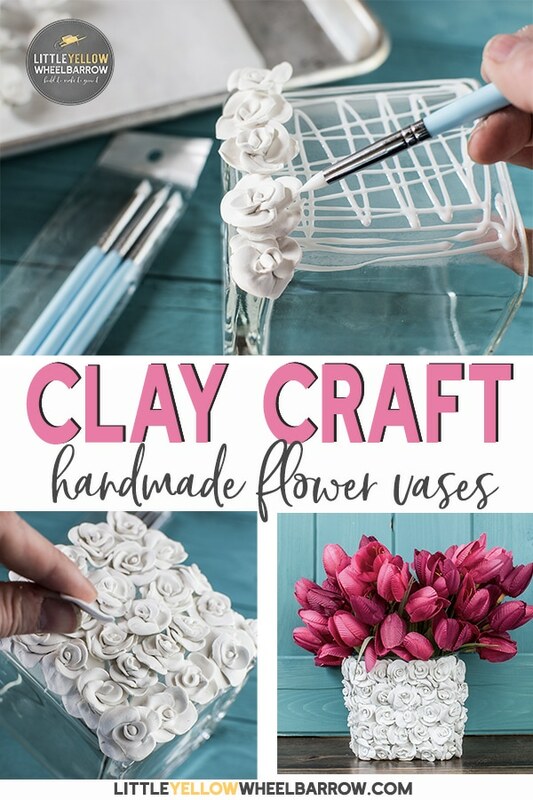 How to make beautiful clay craft flower vases with this simple method. 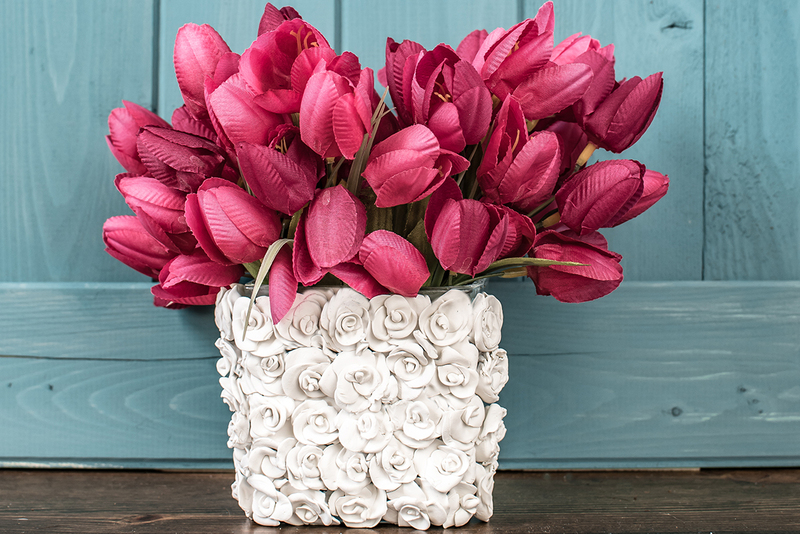 These clay craft flower vases turned out far better than I had expected. This polymer clay tutorial is very easy and perfect for the beginner clay user. I opted to make clay roses for these flower vases but you could make almost anything and could certainly make the project go much faster by using a cutting tool or a mold. A mold would give these a much more polished look. This is also a perfect craft project for Valentine’s Day! 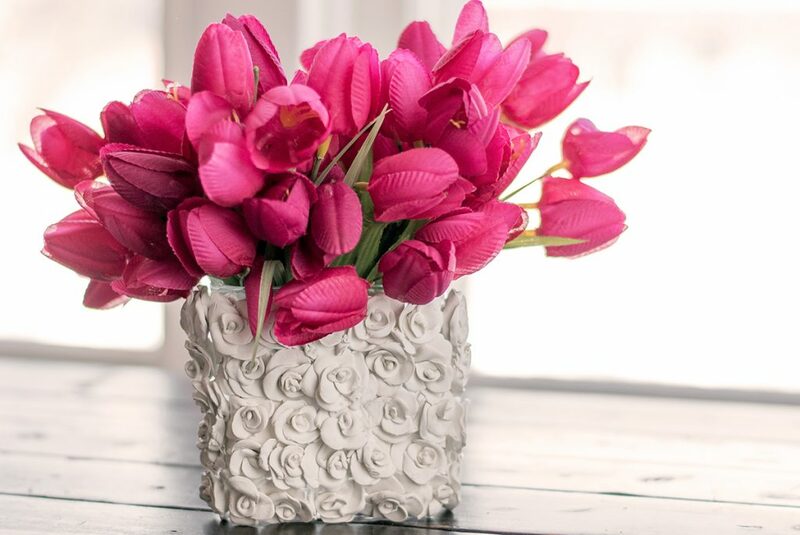 What makes the flower vases pop is the texture. You could use any shape you wanted. I find the hand-shaped clay craft roses add layer upon layer of texture so I thought they would be perfect for this project. Also, I have a small obsession with anything floral. My rose texture pillow tutorial is another example where I use this method with a completely different medium and get wow results! I also have a small obsession with real flowers and dry hundreds of them in the summer. 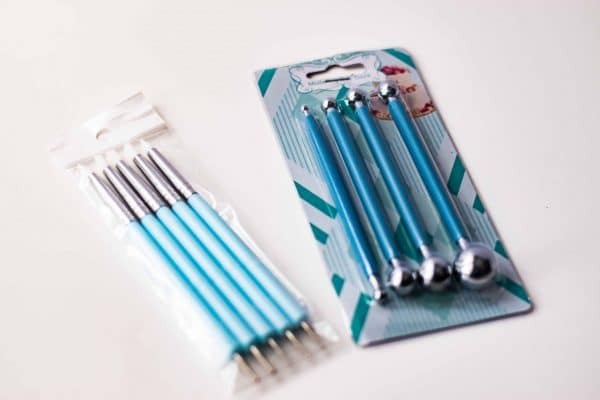 The polymer clay tool set is very inexpensive and came with dotting tips, silicone tips (which I found very useful) and a great set of ball tips for creating ruffles and bends. I have a set of these for fondant, and honestly, my fondant set isn’t nearly as good as this set. I used Sculpey III for my clay craft roses. I found the clay to be very pliable and easy to use. If the clay was too warm, I found I had to do a lot of fiddling with tools to separate the layers. I rolled out and shaped my roses on a piece of brown paper bag. I found it worked well for me and reduced sticking. I’ve also heard that using plastic wrap works well. I kept a tiny bit of cornstarch on hand for my fingers and gloves to reduce sticking. I also highly recommend using a pair of gloves. It does not matter how clean your hands are I find without the gloves my white polymer clay gets dirty rolling around on my hands. If you want to keep your clay craft project clean use gloves and make sure your area is clean and dry before you start working with your clay. 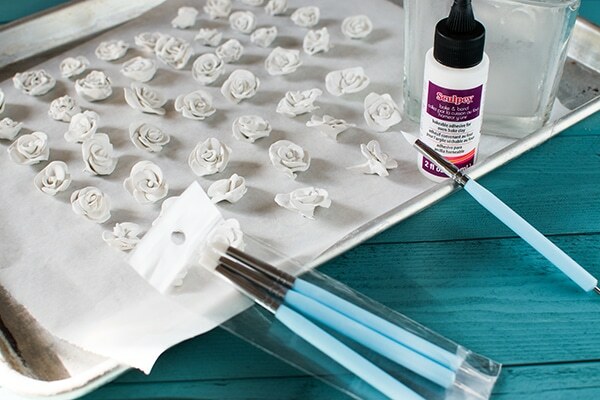 There are several ways you can make your roses. I thought I would use the easy way which was to roll out strips of clay and shape them into petals with a ball tool. Once the strips are rolled out making them into mini flowers is a snap. Using the ball tool start to flatten your clay in sections. Use the ball tool to flatten and ruffle the edges. 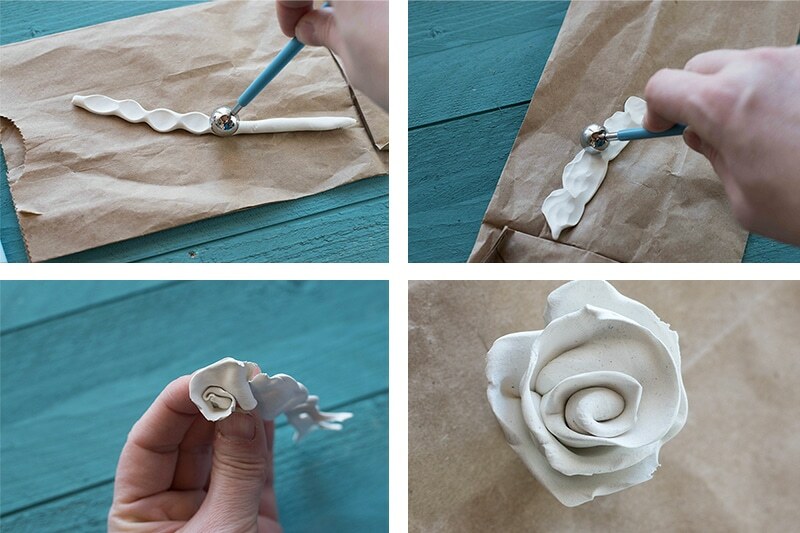 Roll your flattened piece of clay around to create a flower. 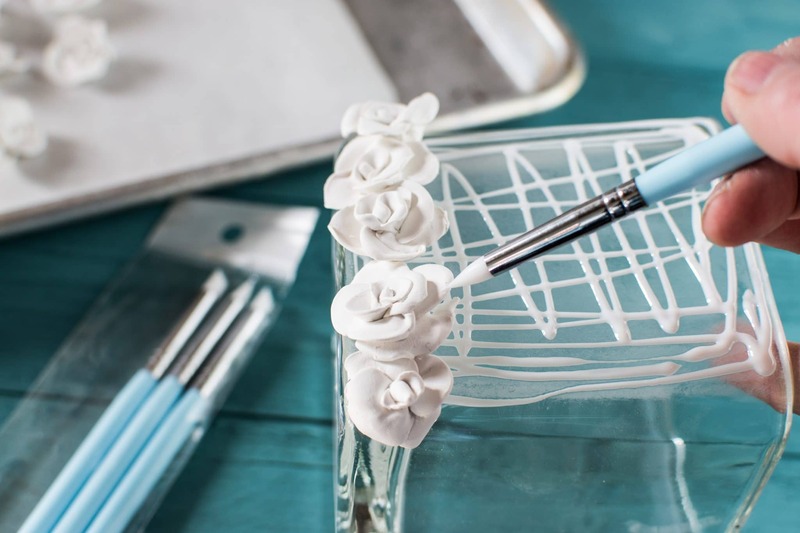 You can use your silicone tip tools to smooth out any rough or broken petal edges. I also used the silicone tip tool to pinch and press some of the layers into the center to make individual petals. I made 150 single roses for my small vase. Each rose was about 3/4 inches or smaller, and I used a total of 132 for the whole project. I also used 3 1/2 ounces of clay for the entire project. Ok so polymer clay doesn’t always play nice with glass. 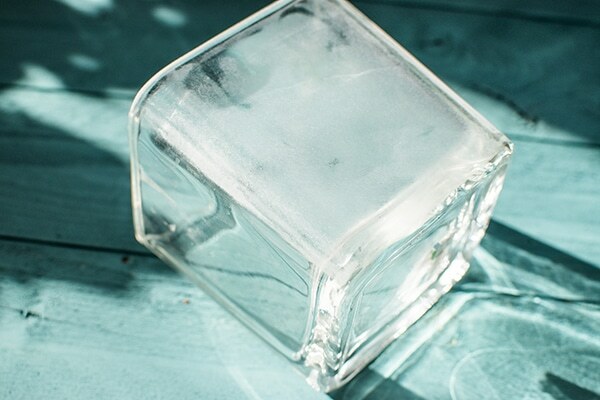 Glass is not a porous material, and although things may stick to glass, it isn’t going to last forever. Anything glued to glass might not last 5 minutes. If you prep your surface you’re going to have better results. I choose to sand my glass to rough it up, so the glue had a better chance of making a bond. You can do this with a simple piece of sandpaper but using a hand sander makes quick work of this step. I gave my flower vases a good pass with 120 grit sandpaper and created a very rough surface with very little effort. 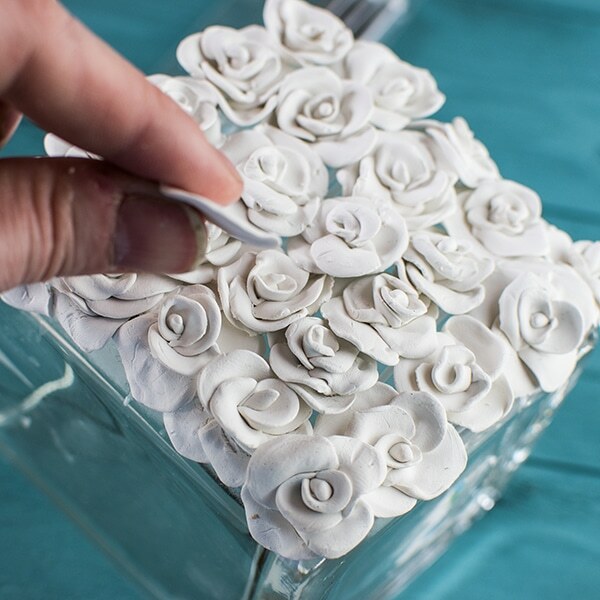 Attaching the roses to your flower vases. I added a layer of glue all around the front and corners of my vase and started to place my roses. The roses were set in place with a soft silicone pointed tool. The tool allowed me to fiddle around to get the flowers in place at the base without marking or ruining any of the visible flower petals. I continued up the front and added a layer of flowers on top of the previous layer. I was sure to add extra dabs of glue to attach the flowers to each other and the glass vase. When I completed the front and corners, I gave the entire thing a good look over and any small areas that were open I just added a little petal here and there and attached it with glue. I finished the back and sides the same way. Be sure to start from the bottom and work your way up. Make sure you corner pieces overlap a little to make it look like a single piece of clay work. The glue and the polymer clay naturally attached to the sanded glass. 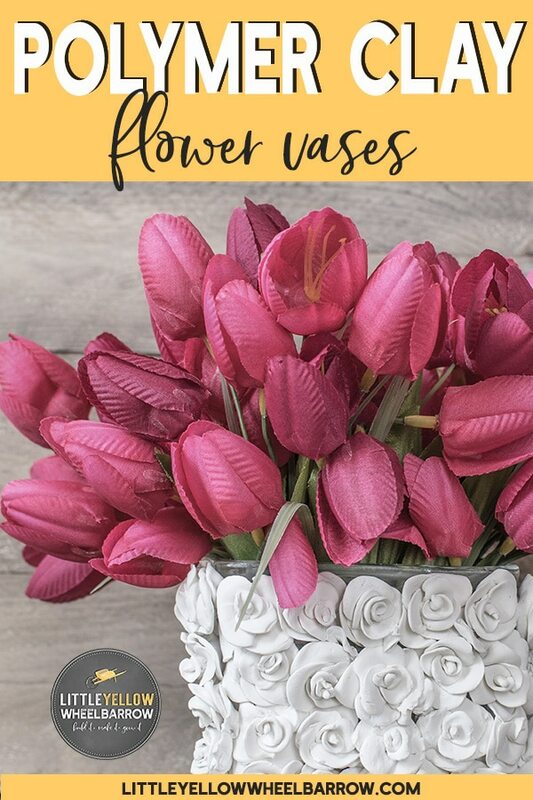 You can place your flowers on all sides of the vase before putting it in the oven. I thought I would have to do it in sections thinking the roses might not adhere to the glass before baking but that wasn’t the case. I had no problems at all with the flowers falling off before baking they stuck to the glass and each other quite well. My vases went into the oven at 275 for 30 minutes. They are a bit thick through the center, and this amount of time was perfect. Sculpey recommends 15-25 minutes. My vases were VERY thick glass, and I was not concerned about it cracking, but you need to be aware that any glass in any oven can crack, shatter, or break. Keep this in mind if you decide to give this polymer clay tutorial a try. 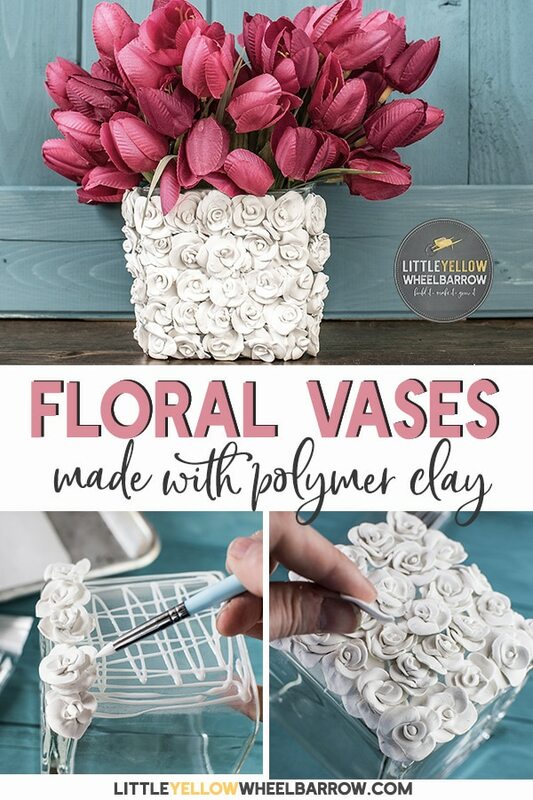 I would not submerge these clay craft flower vases in water. I also wouldn’t try to clean them with any harsh cleaning product. The clay craft roses are delicate and may release from the glass. If this happens, you can glue the piece back in place. 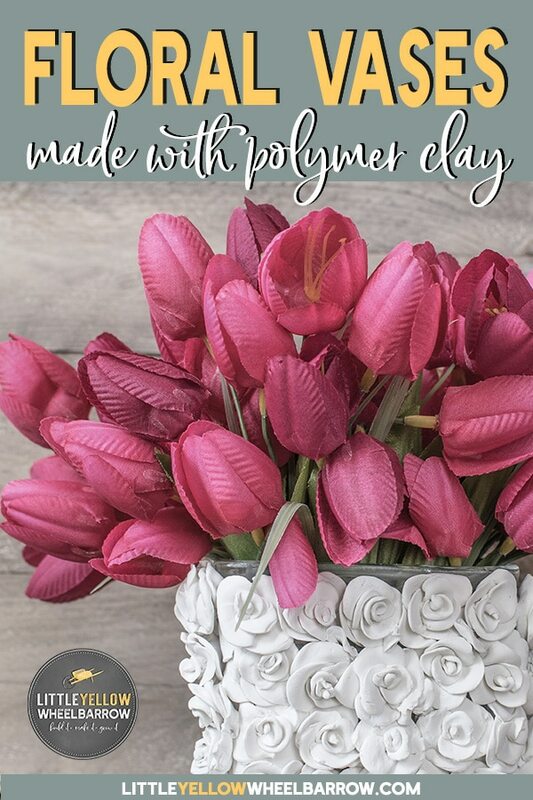 I tried to pick a clay flower from my vase and I could not. I am sure if I wanted to peel the flowers off I could, but it would take a bit of prying. Although polymer clay doesn’t do well on glass, I feel that sanding gave the surface a bit more adherence and I should get a decent lifespan out of these little floral vases. I also like how this polymer clay dries. It looks a bit like porcelain, and I love that look. I have it in my head that one day I will have a kiln, and I play around with real porcelain clay, but for now, this does the trick and looks the part well enough. This project would look cute as a pencil cup too, and if you had the patience, you could make a matching picture frame! …or if you were daring …a set of lamps! What a cute idea! My love has just begun with polymer clay, so I’m excited to try new things! Thanks for sharing! Thanks, Becky! I am also suddenly obsessed with polymer clay. It is such a fun medium to play with and you really don’t need to be expert to use it.